Two days ago, a close friend of mine was having a birthday, and the moment I stepped into the car, he told me his idea of celebrating the day was: AKS – ‘Asal Kamu Senang’ (in english: ‘Whatever Pleases You’). So of course I went on board with his brilliant idea! LOL. Ok take one more, then! It’s pretty sad cos I really love their Kerastase Treatment. This is the treatment room and a pic of me wearing the robe, taken on March haha. Ah, it’s time for a meal! Hahaha actually I felt pretty awful for my friend because it was his birthday and he got to do all these girly stuffs. Well in my defense, it was HIS idea to get me pleased (:b) and in my second defense, he seemed to enjoy it as well, aside from the complaining. Hahaha. 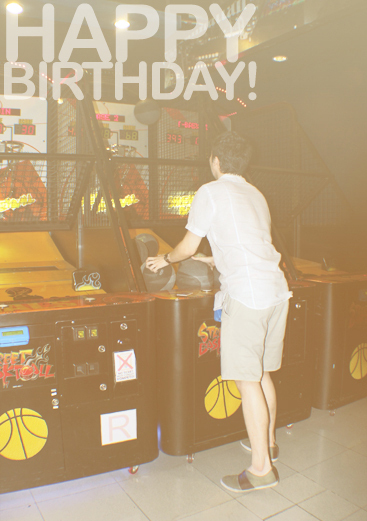 He just got back from the car for taking the camera, and took these pics of me playing basketball wth. Super wrong outfit for the game but, nevermind :b I scored 217 pts, btw! Hm, haven’t lost my skill, apparently. Hahaha..
Lousiest karaoke ever, choosing the songs was quite a challenge with that giant remote over there T_TAnd… Here’s my favorite!! Didn’t ride this carousel for real anyway hehe. Containing a pretty dress, a beautiful pink rose and a thoughtful handwritten letter. .Photo Courtesy of Google and Elleandjess.